Senator Kamala Harris waves to a crowd in her hometown, Oakland, to officially announce her 2020 presidential bid. 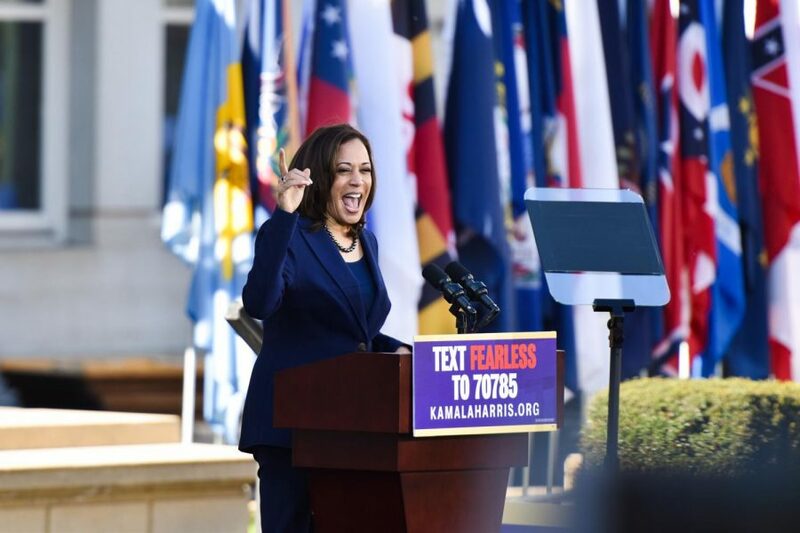 Sen. Kamala Harris (D.-Calif.) announced her bid for the 2020 presidential election this afternoon at a launch rally in the Frank Ogawa Plaza of her hometown, Oakland. Kamala Harris addresses a large crowd gathered in the Frank Ogawa Plaza in her hometown, Oakland, to officially announce her bid for presidency in 2020. Throughout the course of her launch speech, which comes days after a week-long government shutdown and a closely-watched stand-off between Congressional Democrats and Republicans, Harris touched on a variety of national and local issues, moving from her own background as San Francisco District Attorney to her criticism of the current administration’s policies. Among the national issues that Harris brought up in her panoramic speech were economic reform, immigration enforcement, bank regulation, gender equality, minority rights, universal healthcare, climate change, gun violence, foreign policy and, most notably, the current administration of President Donald Trump. 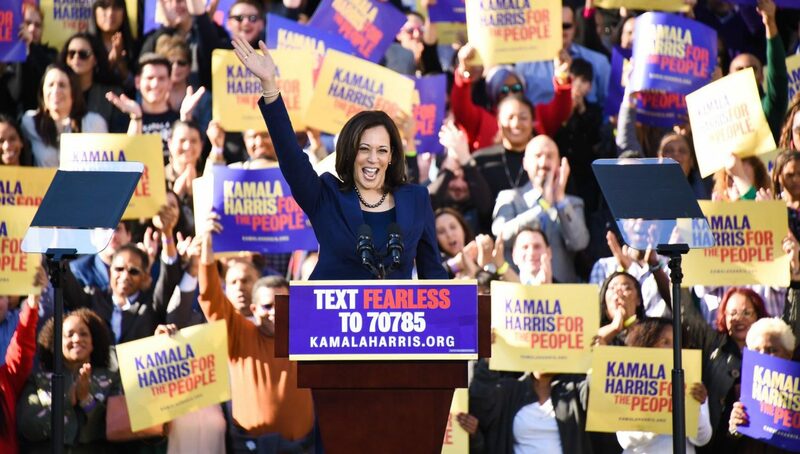 The rally, which was scheduled to begin at 12 p.m., brought crowds of local voters, children and supporters alike to downtown Oakland, where entire city blocks were lined with people hoping to hear Harris speak. Harris’ campaign, “For the People,” was echoed across posters, T-shirts and buttons, and a number of other perspectives were voiced across the rally as well, ranging from a long yellow banner calling for environmental reform to a white posterboard that criticized Harris’ past record on criminal justice and drug law enforcement. 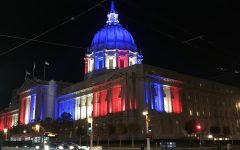 Before Harris’ launch speech, a number of other speakers and performers, including Oakland mayor Libby Schaaf and student musicians from Skyline High School, took the stage and built up crowd spirit. 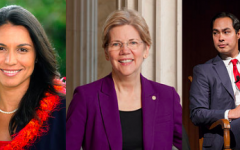 Harris’ announcement follows several prominent Democrats’ declarations of their bids for the 2020 presidential election, among which include Sen. Kirsten Gillibrand (D.-N.Y.), Sen. Elizabeth Warren (D.-Mass. ), former Secretary of Housing and Urban Development and former San Antonio mayor Julian Castro and Rep. Tulsi Gabbard (D.-Hawaii). More bids are expected to come in the next few weeks? 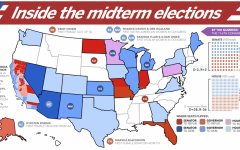 months?, with many eyes turned towards former Vice President Joe Biden and Rep. Beto O’Rourke (D.-Texas) as possible Democratic candidates as well.